At East Texas Orthodontics, we want our patients to understand how essential it is to keep your retainer clean. In fact, it’s just as important to brush your retainer as it is to brush your teeth. The biggest concern is that retainers can harbor dangerous bacteria. But besides that, they can begin to smell and taste funny if you don’t keep them clean. And nobody wants that! Dr. Brown uses all three of these and can talk to you about which one is best for your specific needs. But right now, let’s talk about keeping them clean! The procedures for cleaning the removable Hawyley or Essix retainers are the same, and easy to do. Just remember—whenever you brush your teeth, also clean your retainer if you’ve used it. Always use a soft bristle toothbrush when cleaning your retainer. Just use water, do not use toothpaste. The abrasives in toothpaste, although good for your teeth, can scratch your retainer. Scratches on your retainer cause problems other than just looking worn. Scratches are a perfect place for bacteria to settle and grow, which future brushings may not be able to reach or eliminate. Don’t scrub too hard. Even a soft bristle toothbrush can scratch the surface if you brush heavily. Make sure to brush your retainer on all sides and surfaces. The retainer is in your mouth for hours at a time, so it’s important to brush every bit of it. You can also soak your retainer in a denture cleaner occasionally to freshen it and kill germs that sit in the grooves of the mold. Make sure to remember though, soaking does not replace brushing. It’s just something to add for extra cleanliness. Don’t soak your retainer too often—once a week or so is best. When soaking in denture cleaner, follow the instructions on the packaging. Then brush your retainer with your toothbrush and rinse it with warm water to make sure no cleaning solution remains on it. If you prefer, you can also soak your retainer in mouthwash to remove odors and kill bacteria. Mix equal parts mouthwash and lukewarm water. Only soak your retainer in this solution for about an hour. Then, as with the denture cleaners, brush and rinse with warm water. Only use non-alcoholic mouthwash for soaking. Mouthwashes with alcohol can damage the retainer’s plastic. Don’t forget to keep your retainer case clean, too. Frequently scrub it with warm, soapy water, rinse off, and dry. Permanent retainers are attached to your teeth, so you’ll need to floss them daily to keep them clean. The process may seem complicated at first, but you’ll get it down in no time. If you need help, please don’t hesitate to ask! We can show you the technique in person. 1) Use a floss threader to thread the floss between your two front lower teeth. 2) Hold both ends of the floss. 3) Get the floss under your retainer wire, and then move it up and down between your teeth all the way to the gum line. 4) Slide the floss sideways to the next area you want to clean. Pull down until it’s between your next teeth. 5) Repeat this process with each tooth that’s attached to your permanent retainer. After spending time and money to straighten your teeth, you’ll want to keep them nice. Cleaning (and using!) 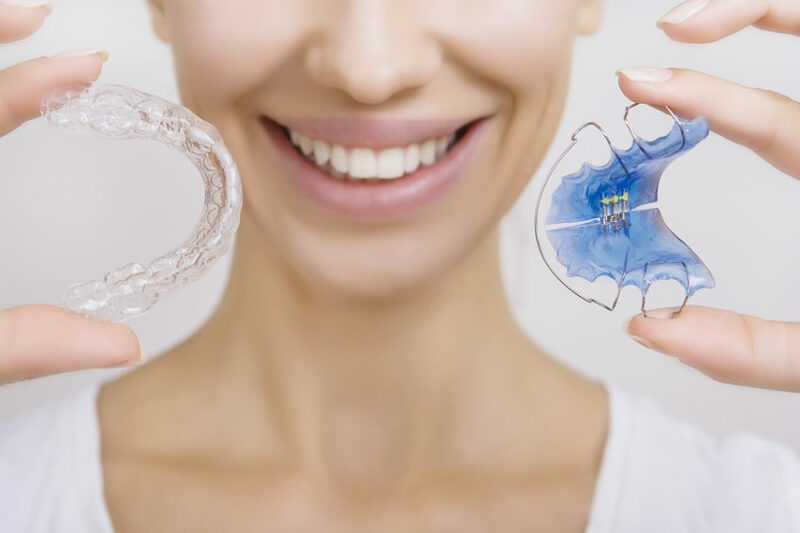 your retainer will keep your newly straightened teeth clean and beautiful.